I have been home alone for a couple of days. I am pretty bad at being alone with myself. I like me, don't get me wrong, but when it comes to entertain myself, I am not enough.- It's not me, it's myself, I need something else, I understand, right?- Yes. -OK. (See? Not good at being alone). Fortunately my sister is coming today to take me away from this crazy solitude. One of the things that I'm bad at when I'm alone is eating. I tend to skip lunch, and then I get super hungry and I start going to the fridge to snack trying to deceive my stomach until dinner. Yesterday was no exception. I spent all day cleaning and doing laundry like a crazy person, and I forgot to eat lunch. When I finished the chores I decided that I was going to eat dinner like a normal person, or actually, like two normal persons, because I was very very hungry. So I found this recipe and 3 perfect reasons to make it: 1) it looked yummy; 2) I had chicken in the freezer and parsley in a glass of water; 3) I wanted to use our new food processor and I hate hate hate chopping parsley by hand. 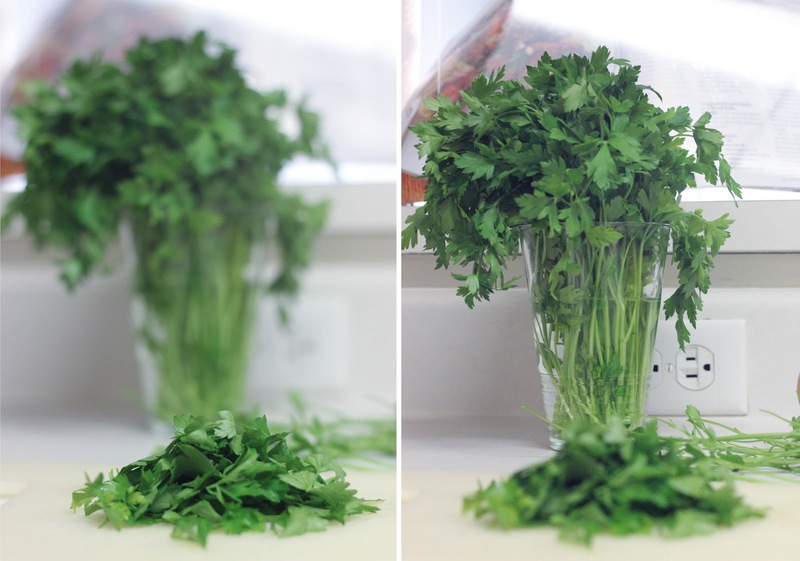 The trick of putting the parsley in a glass of water is something that I have learnt from my mom and my grandma. It's a great idea! It stays fresh for about 2 weeks. Another way to keep fresh parsley that my grandma recently showed me is to freeze it in a tupperware once chopped. 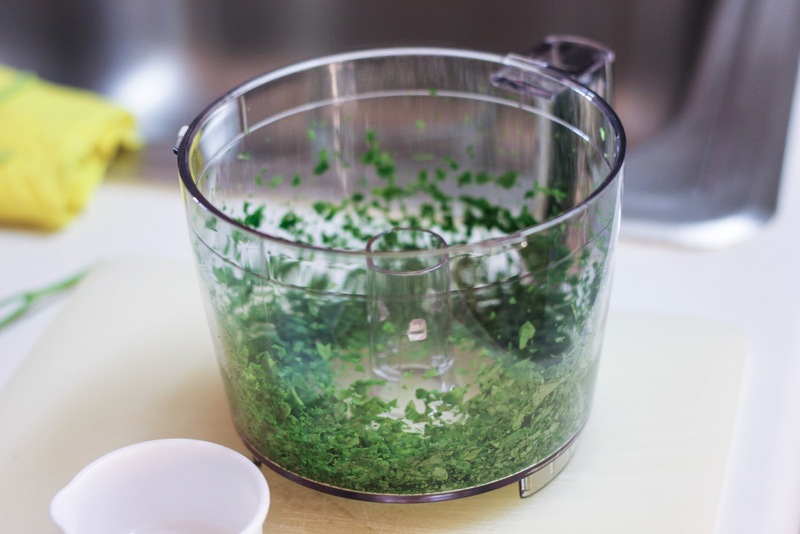 The food processor worked great for chopping the parsley, a process that lasted exactly 5 seconds. I was so amazed. Goodbye chopping parsley with a knife! The recipe did not disappoint. On the contrary, it was delicious. Although it calls for one hour and fifteen minutes of braising, I only cooked it for 45 minutes. Scott always accuses me of cutting down cooking times, but this time I was about to starve so I couldn't help it. 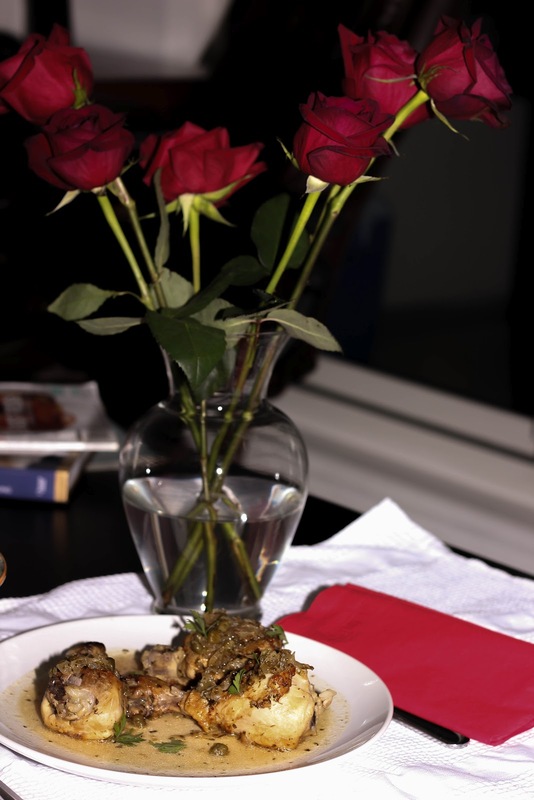 Finally, I got my meal of the day in company of these pretty roses. I don't like eating alone. Heat 2 tablespoons of olive oil in a heavy skillet over medium heat. Add onion; cook, stirring often, until softened, about 4 minutes. Transfer onion to a bowl. 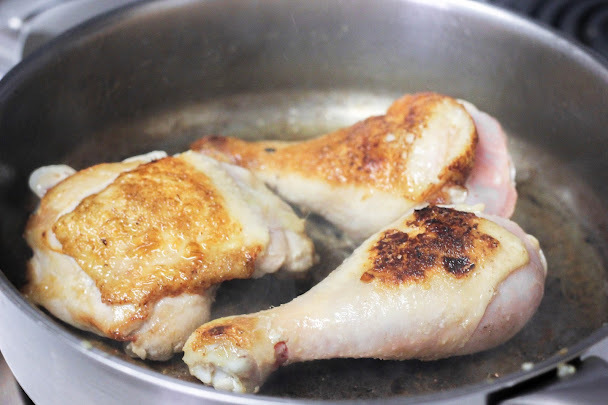 Add more oil to the skillet and increase heat to medium-high. Season chicken with salt. Add chicken to skillet and cook, turning once, until golden brown on both sides, about 10 minutes. Transfer chicken to a plate. Add reserved onion, parsley and capers to skillet and cook for 1 minute. Add chicken stock, vinegar and chicken with juices. Reduce heat to medium-low, cover and simmer until meat is tender and falling off the bone, about 1 1/4 hours (or 45 minutes if you can't wait). Transfer chicken to a plate. Season sauce with salt and pepper and spoon over the chicken. Eat, alone or not. Note: For 2 servings, just add more chicken. 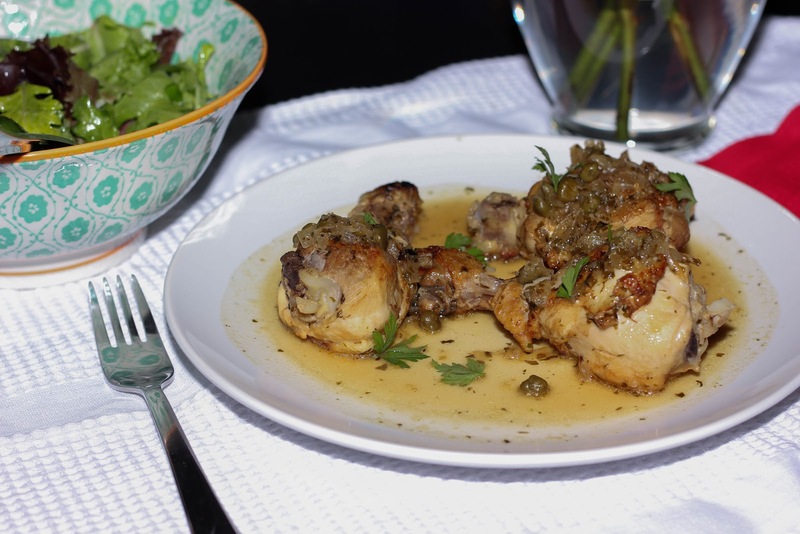 For 4 servings, double the stock, the vinegar, the parsley, the onion and the capers.